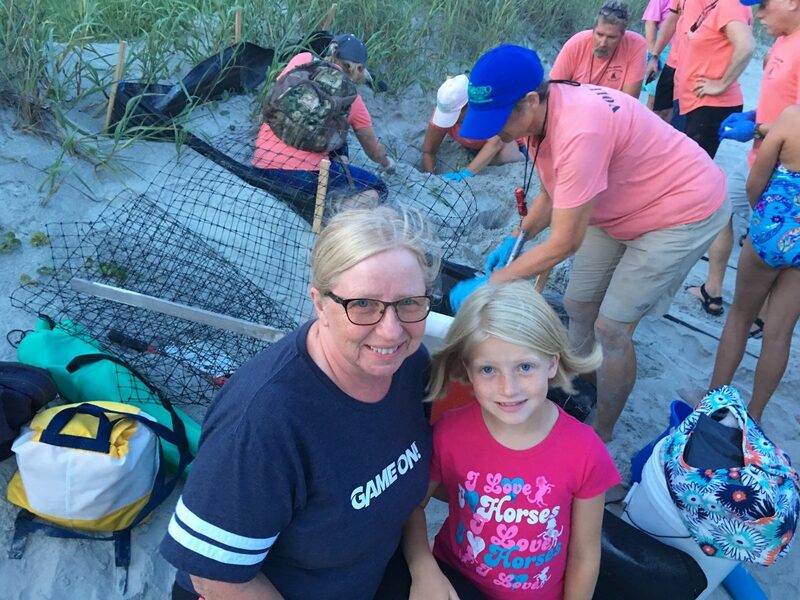 “COOL!” little Brinley McNeill from Nebraska beamed, while Ocean Isle Beach Sea Turtle Protection Organization (OIBSTPO) volunteers carefully excavated and inventoried Nest #4 at sunset. For three days the nest had presented new life, freeing 114 baby Loggerheads from their leathery eggshells. The time had come to gently hollow out the sandy womb and see if any more tiny ones needed a lift. ‘Our all-terrain vehicle driver looks for tracks in the morning and found this nest in June. One of our teams came in to assess it. We have protected it from predators all this time. Now, we are going to carefully remove layers of sand and take inventory as far down as where her back flippers dug. Deb and Fulton Allen are the organization’s coordinators. Deb Allen said the time span between laying and hatching on Ocean Isle Beach is an average of fifty-seven days. The average egg count is 125. One prolific nest, she remembers, yielded 211 eggs. This season, there are twenty-one nests on Ocean Isle Beach and sixteen more yet to hatch at the time of this article. Allen says that 76% of the eggs, on average, hatch and emerge from the nest to ocean. That’s a potential of a couple thousand hatchlings this year, which requires a lot of volunteers! Allen said her organization has around 100 hard workers, and all but two reside on Ocean Isle Beach, ranging in age from 22 to over 75. 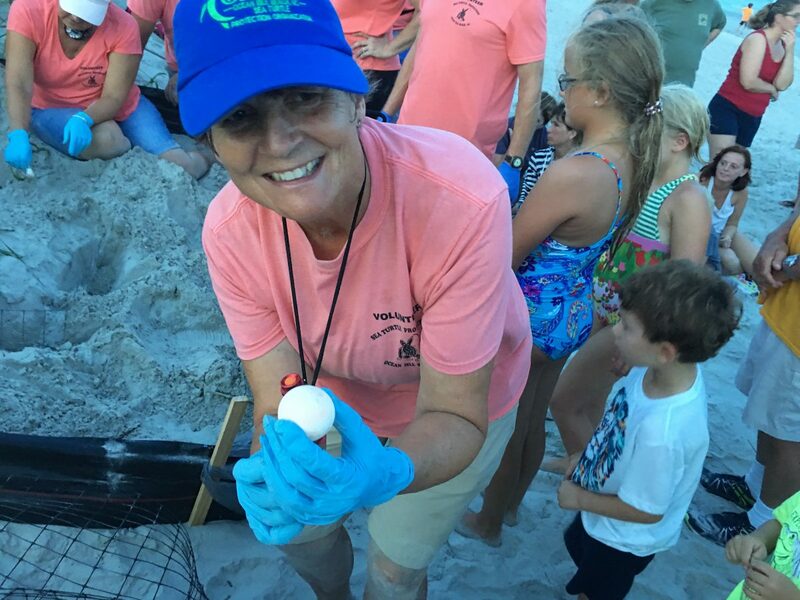 Six-year veteran volunteers Peter and Ginny Maguire, the nest parent coordinators, have trained about half of that number, whom they lovingly refer to as “TWITs” – Turtle Watchers In Training. There’s probably no way of knowing how many sea turtle protectors there are in the U.S. Innumerable baby turtles bust from their shells from May to September all along the Gulf Coast, from Texas to Florida, and the Eastern Seaboard, north to (albeit rarely) New Jersey. What is evident, however, is that the job is demanding. Sadly, only one in 1,000 turtles will survive to maturity. This means that for all the time the local volunteers spend this summer, the odds are just two turtles will live to old age. For Loggerheads, which grow to about 350 pounds, that may be age 90. Loggerhead is the most common breed which nests in this part of the state and is considered a “threatened” species. Leatherback turtles are “endangered,” and the Kemps Ridley turtle is “critically endangered.” In the sea, anything larger than a turtle is considered a predator, Allen says. So their chances once in the ocean are not great. But even before the hatchlings make it into the water, they are sought out by land predators such as foxes, ghost crabs, raccoons, birds, free-roaming dogs and cats – and sometimes humans. This is not even considering potential climate change, pollution, oil spills, etc. Volunteers work hard to protect the eggs from these poachers, and that includes setting up nest barriers made from PVC poles, plastic mesh to cover the nesting area, wire grate for domes and buried barriers, and biodegradable orange or pink flagging to clearly mark the nests. They also dig trenches that serve as runways to guide the hatchlings to the water. 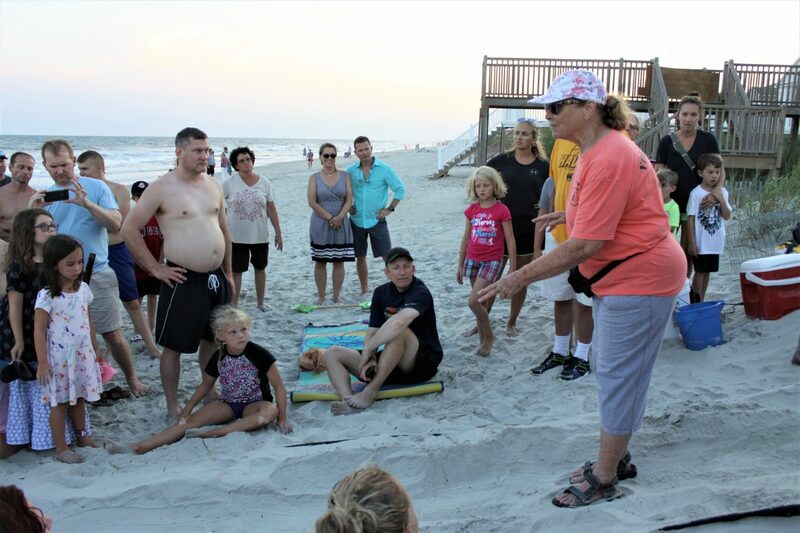 Volunteers additionally educate the public about the plight of the animals by holding “turtle talks,” conversing with visitors on the beach and public events, responding to strandings, and more. Allen points out that volunteers start keeping a keen eye on nests at day 45. They stay on site from 7 to 11 p.m. and remain if there is activity. Back at Nest #4, Kerry Kennedy has declared the nest officially “closed.” They’ve found no more hatchlings to help, and three intact but infertile eggs. Mother turtle and the volunteer team have done well. Of 117 offspring, 97% made it into the ocean. In America and North Carolina, people are beginning to understand, Allen says, that humans are the only animals that can save our planet. Every living thing has its purpose, even if we don’t readily understand what it is. That’s why so many spectators rally around the nests that are about to “boil.” Those who experience these magnificent births are filled with joy at the determination of these little ones to survive. 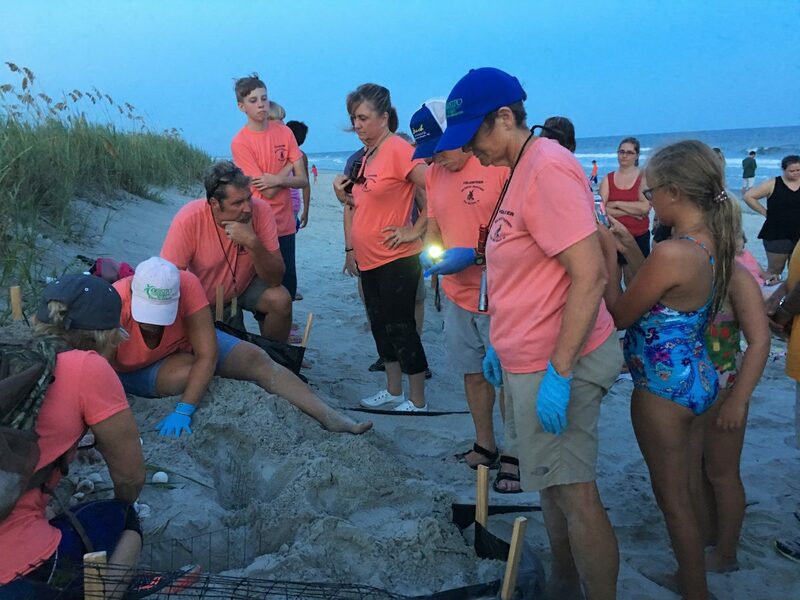 Want to help Ocean Isle Beach Sea Turtle Protection Organization? 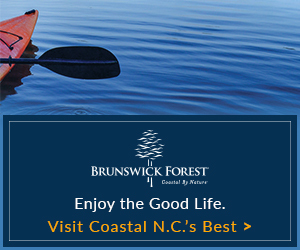 OIBSTPO is an independent non-profit operating under the auspices of the Museum of Coastal Carolina. Donations can be sent to to OIBSTPO, PO Box 6524, Ocean Isle Beach, NC 28469.